Modern luxury meets Southwestern charm at The Four Kachinas Inn, a bed and breakfast in Santa Fe. 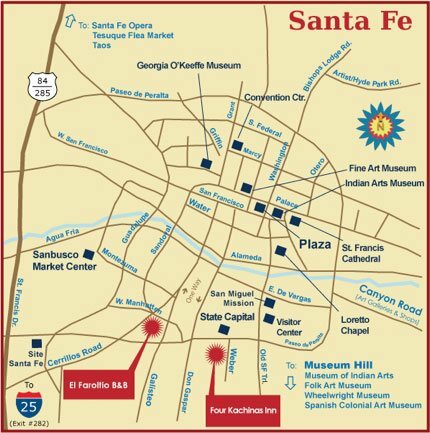 Our prime location is just steps away from the heart of the scenic downtown area providing guests a short commute to everything Santa Fe has to offer. 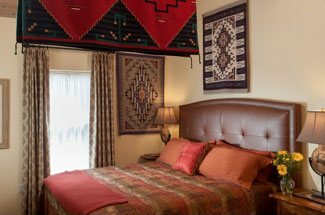 The Four Kachinas Inn prides itself on offering all the modern amenities of a traditional Santa Fe hotel. However, we also provide guests with a homey experience. Our bed and breakfast offers the best in Santa Fe lodging featuring six uniquely decorated rooms, all complete with the very best amenities. Each room features fine linens, air conditioning, private entrances, TV’s, Wi-Fi, and more. 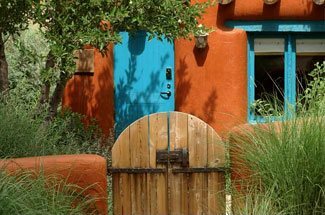 Our Santa Fe bed and breakfast is unique because guests will find original Native American, Spanish Colonial, and regional art, along with locally handcrafted furnishings. All of these features are highlighted by our traditional New Mexican architecture found throughout the rooms and common areas. Unlike other bed and breakfasts in Santa Fe, our inn is made to feel like your home away from home! Santa Fe is a fascinating city alive with a rich historical and cultural scene that will inspire you. 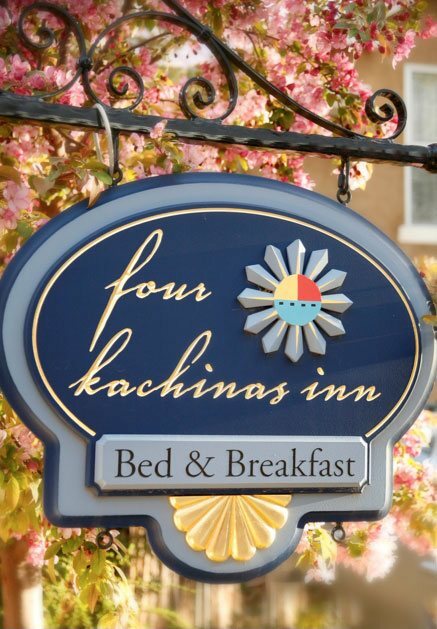 The Four Kachinas Inn is located in the middle of the excitement that the area has to offer. The diverse art scene encompasses a broad array of works; from ancient traditional techniques to contemporary and edgy surprises. Your senses will go wild when you take to the enchanting Santa Fe streets. Also near our Santa Fe inn are a number of delicious restaurants! Home to more than just its signature green chile, Santa Fe is also home to many award winning chefs and restaurants. Lastly, for those looking for active fun during your stay with us, Santa Fe is surrounded by 1.5 million acres of pristine National Forest begging to be explored. The 320 days of annual sunshine gives you the perfect weather to do just that. With the cleanest air around and unparalleled scenic vistas, Santa Fe is a city that can’t be beaten. Our bed and breakfast is the perfect home-base for your journey into Santa Fe where you can explore and relax for awhile. Find our Conveniently Located B&B in the Heart of Santa Fe! Contact us today for more information and to book your stay at our Santa Fe inn!